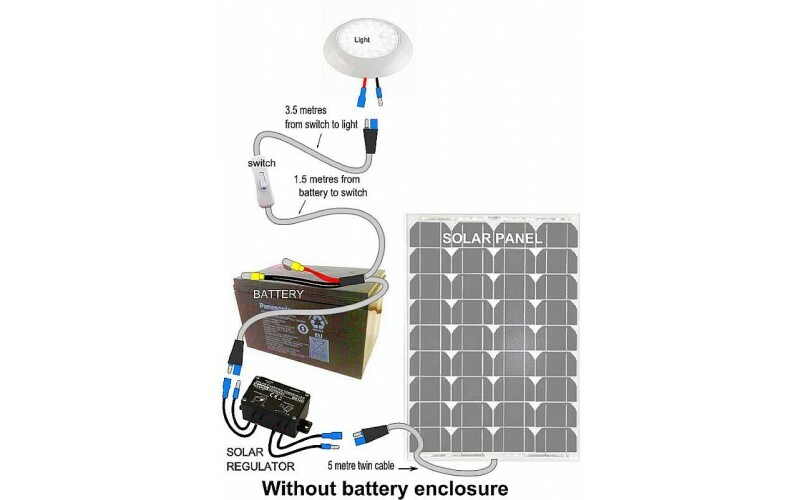 This solar powered light can be installed in a shed or for outdoors lighting for a gazebo or barbecue area to provide lighting without having to connect to mains power. 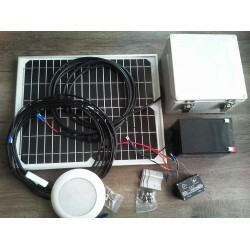 It is operated by 12 volt DC electricity so it is safe to install and operate. The LED light will run for 9 hours on a fully charged battery. In everyday use it will provide lighting for 3 hours and still have reserve power for another 2 days, which may be required on overcast days when the sun does not provide enough solar power. installation instructions and a layout diagram is included, and the cables are labelled to ensure quick and easy assembly. The solar panel is installed on the roof using the mounting brackets. The battery and solar regulator are placed indoors (or outdoors if you include the weatherproof enclosure). The battery is a sealed type and can be placed in any position. 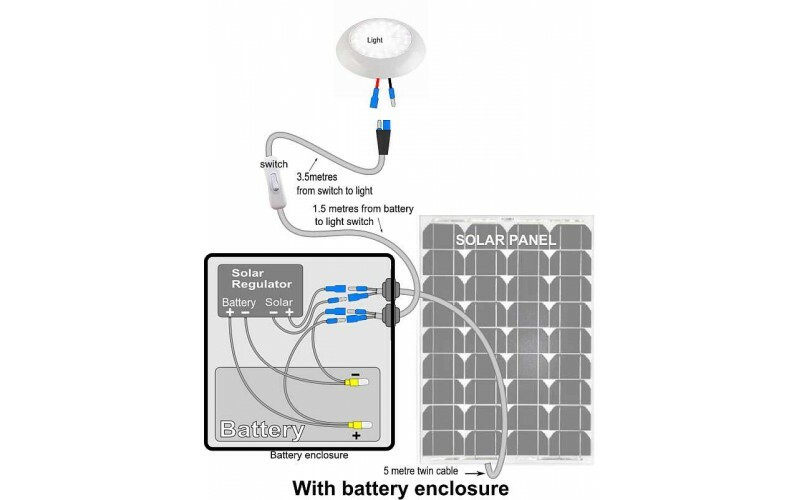 It is connected to the solar regulator which is then connected to the solar panel. The light is also connected to the battery. 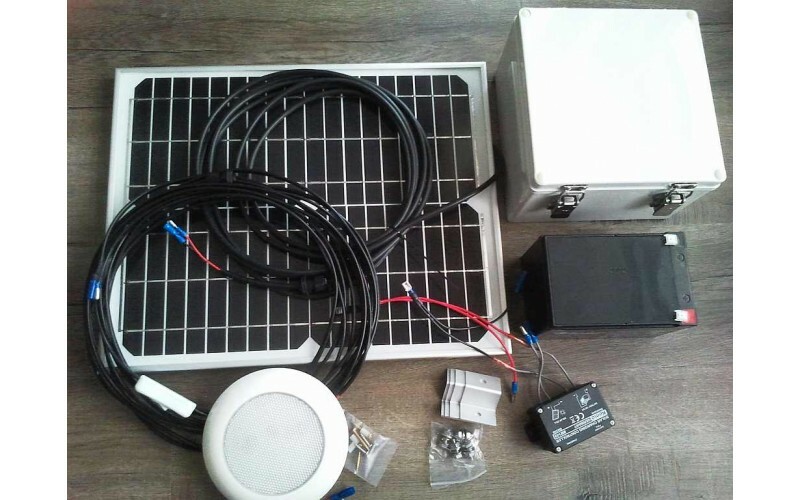 The solar lighting system is now ready for use. Battery and solar regulator are housed in this sealed enclosure. It has a sealed hinged lid and two holes drilled in the side and fitted with cable glands for the light and solar panel cables to pass through. Use the comments text box if you want modifications to the standard kit, we try to provide exactly what you require.